The Domke ProPack 414 Backpack (Black) is a canvas pack designed to carry a pro digital SLR camera body, zoom lens, 1-2 additional lenses, flash, cords, chargers and other accessories. The pack has a laptop section for a computer with a screen up to 15.4", a removable insert and a set of removable dividers to customize the interior. There are 3 large front pockets, interior pockets and a tripod holder. 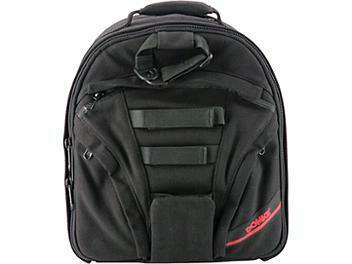 The 414 backpack is carried by a top handle to grab and go, padded backpack straps, a sternum strap and a waist strap. Laptop section for a computer with a screen up to 15.4"